If your kids are anything like mine then they will have slime on their Christmas lists. Emmy is obsessed with the stuff – she plays with it, watches others playing with it on YouTube, makes her own and even watches others making it again on YouTube. Recently she reviewed the Poopsie Unicorn Slime maker which we didn’t rate at all, you can read that review here just in case it’s on a Christmas list in your household. Instead of paying £50 on a Unicorn which poops slime rather badly, why not have a go at making your own. Here are the instructions for a lovely Christmas Wrapping Paper Slime which is far easier to make and cheaper too. Add the chunky glitter flakes. 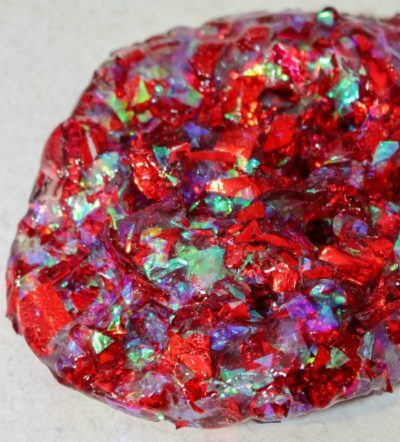 My children love mixing this all together and you can make it as sparkly and glittery as you like, you could even match the colours to your Christmas tree decorations this year if you wanted to. Why not make up a few batches and give to school friends as a cheap gift idea. Oh my! My girls love slime!!! They would love this! That’s a great idea for any metallic wrapping paper after Christmas instead of just throwing it away! Oh, goodness! What messy and colourful fun! Thank you for sharing the recipe and pics. That looks really effective and I think my grandchildren would enjoy playing with it!